Non-parametric belief propagation (NBP) is a well-known message passing method for cooperative localization in wireless networks. However, due to the over-counting problem in the networks with loops, NBP’s convergence is not guaranteed, and its estimates are typically less accurate. One solution for this problem is non-parametric generalized belief propagation based on junction tree. However, this method is intractable in large-scale networks due to the high-complexity of the junction tree formation, and the high-dimensionality of the particles. Therefore, in this article, we propose the non-parametric generalized belief propagation based on pseudo-junction tree (NGBP-PJT). The main difference comparing with the standard method is the formation of pseudo-junction tree, which represents the approximated junction tree based on thin graph. In addition, in order to decrease the number of high-dimensional particles, we use more informative importance density function, and reduce the dimensionality of the messages. As by-product, we also propose NBP based on thin graph (NBP-TG), a cheaper variant of NBP, which runs on the same graph as NGBP-PJT. According to our simulation and experimental results, NGBP-PJT method outperforms NBP and NBP-TG in terms of accuracy, computational, and communication cost in reasonably sized networks. Obtaining location estimates of each node position in wireless network as well as accurately representing the uncertainty of that estimate is a critical step for a number of applications, including sensor networks , cellular networks , and robotics . We consider the case in which a small number of anchor nodes, obtain their coordinates via Global Positioning System or by installing them at points with known coordinates, and the rest, unknown nodes, must determine their own coordinates. Since we want to use energy-conserving devices, with lack the energy necessary for long-range communication, we suppose that all unknown nodes obtain a noisy distance measurements of the nearby subset of the other nodes (not necessarily anchors) in the network. Typical measurement techniques [1, 4, 5] are time of arrival (TOA), time difference of arrival, received signal strength (RSS), and angle of arrival. This localization technique is well known as cooperative (or multi-hop) localization. Most of the state-of-the-art methods for cooperative localization estimate the point estimate of the sensor positions by applying classical least squares, multidimensional scaling, multilateration, or other optimization methods. These methods, also known as deterministic methods[1, 6–8], lack a statistical interpretation, and as one consequence do not provide an estimate of the remaining uncertainty in each sensor location. 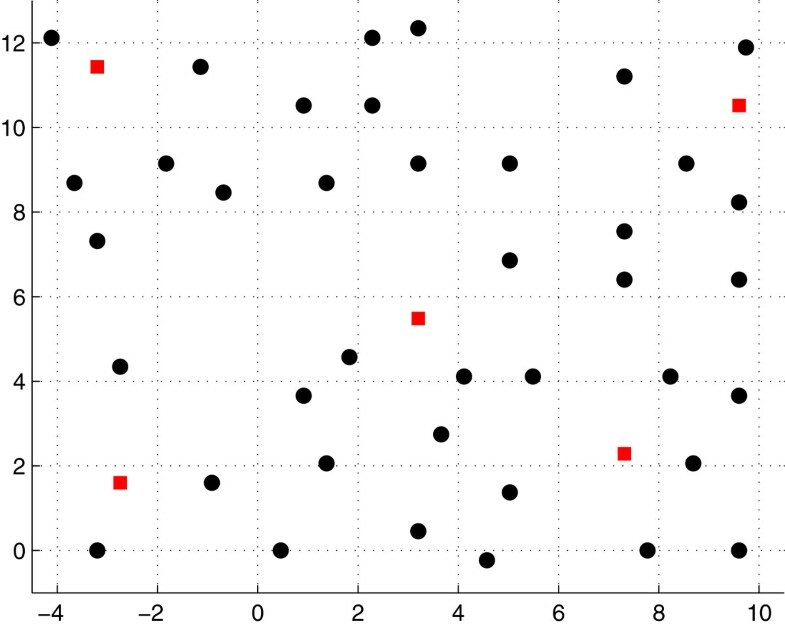 On the other hand, Gaussian probabilistic methods (such as multilateration by Savvides et al. , or variational method by Pedersen et al. ) assume a Gaussian model for all uncertainties, which may be questionable in practice. Non-Gaussian uncertainty is a common occurrence in real-world sensor localization problems, where typically there is a fraction of highly erroneous (outlier) measurements. This problem can be solved using non-parametric probabilistic (or Bayesian) methods [11–14], which take into account uncertainty of the measurements. They estimate the particle-based approximation of the posterior probability density function (PDF) of the positions of all unknown nodes, given the likelihood and a prior PDF of the positions of all unknown nodes. However, the main drawback of these methods is high complexity of marginalization of the joint posterior PDF, especially in large-scale networks. Nevertheless, an appropriate factorization of the joint PDF using some message-passing technique make these methods tractable. Non-parametric belief propagation (NBP), proposed by Ihler et al. [11, 12], is a well-known particle-based message passing method for cooperative localization in wireless networks. It is capable to provide information about location estimation with appropriate uncertainty, to accommodate nonlinear models, and non-Gaussian measurement errors. However, due to the over-counting problem in the networks with loops, NBP’s convergence is not guaranteed, and its estimates are typically less accurate . Our previous proposals, using NBP based on spanning trees  and uniformly-reweighted NBP , can mitigate this problem in highly connected networks, but with very small benefit comparing with NBP. Another solution is generalized belief propagation based on junction tree (GBP-JT) method , which is a standard method for the exact inference in graphical models. 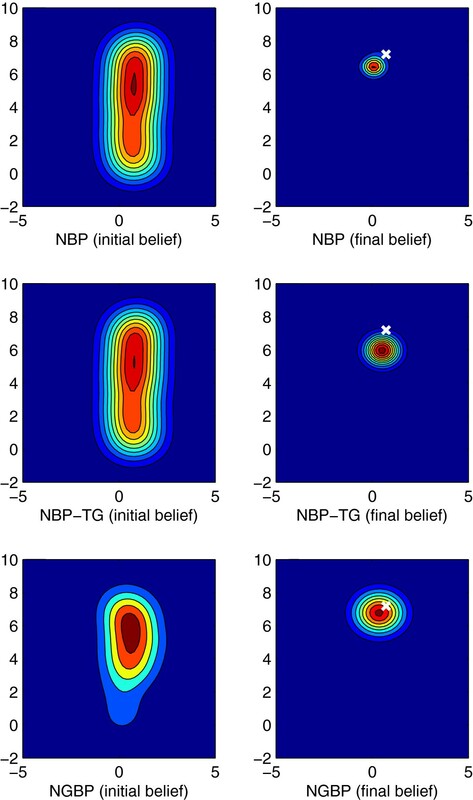 In , non-parametric generalized belief propagation based on junction tree (NGBP-JT) has been applied for the localization in a small-scale network, where it has been showed that it can outperform NBP in terms of accuracy, but with an additional cost. However, there remained two main problems: (i) how to efficiently form the junction tree in an arbitrary network, and (ii) how to decrease the number of particles. Therefore, in this article, we propose non-parametric generalized belief propagation based on pseudo-junction tree (NGBP-PJT). The main difference comparing with the standard method is the formation of pseudo-junction tree (PJT), which represents the approximated junction tree based on thin graph. In addition, in order to decrease the number of high-dimensional particles, we use a more informative importance density function, and reduce the dimensionality of the messages. As by-product, we also propose NBP based on thin graph (NBP-TG), a cheaper variant of NBP, which runs on the same graph as NGBP-PJT. According to our simulation and experimental results (using measurements from indoor office environment), NGBP-PJT method outperforms NBP and NBP-TG in terms of accuracy, computational, and communication cost in reasonably sized networks. On the other hand, the main drawback of this method is the high cost in large-scale networks. The remainder of this article is organized as follows. In Section 2, we provide the background on graphical models, correctness of belief propagation, and junction tree formation. In Section 2, we propose an algorithm for PJT formation. Cooperative localization using NGBP-PJT method for an arbitrary graph is proposed in Section 2. Simulation results are presented in Section 2. Finally, Section 2 provides some conclusions and proposals for the future work. The summary of notation is provided in Table 1. A graphical model is a probabilistic model for which a graph denotes the conditional independence structure between random variables. There are two main types: directed graphical models (or Bayesian networks) and undirected graphical models (or Markov networks). For the cooperative localization problem, we use Markov networks (also known as Markov random field). An undirected graph G = (V, E) consists of a set of nodes V that are joined by a set of edges E. A loop is a sequence of distinct edges forming a path from a node back to itself. A clique is a subset of nodes such that for every two nodes in clique, there exists an link connecting the two. A tree is a connected graph without any loops, and a spanning tree is an acyclic subgraph that connects all the nodes of the original graph. Regarding directed graphs, we define a root node, which is a node without parent, and leaf node, which is a node without children. In order to define a graphical model, we place at each node a random variable taking values in some space. Each edge in the graph represents the information about conditional dependency between two connected nodes. In case of cooperative localization, each random variable represents the 2D (or 3D) position, and each edge, which indicates that the measurement is available, represents the likelihood function of that measurement. If we exclude the anchors nodes, the graph can be considered as undirected. where ψ t u (x t ,x u ) is the pairwise potential between nodes t and u. On the right-hand side, there is a product over all messages going into node u except for the one coming from node t. This product is marginalized in order to form the particular information that we want to send to the destination node. In case of continuous functions, the sum over x u have to be replaced with the integral. In practical computation, one starts with nodes at the edge of the graph, and only computes a message when one has available all the messages required. It is easy to see  that each message needs to be computed only once for tree-like graphs, meaning that the whole computation takes a time proportional to the number of links in the graph, which is significantly less that the exponentially large time that would be required to compute the marginal PDFs naively. In other words, BP is a way of organizing the global computation of marginal beliefs in terms of smaller local computations. For the localization problem, this is not sufficient, so we need to represent the messages and beliefs in non-parametric (particle-based) form, as done in . The resulting method, NBP, is capable to approximate the posterior marginal PDFs in non-Gaussian form. The BP/NBP algorithm does not make a reference to the topology of the graph that it is running on. However, if we ignore the existence of loops, messages may circulate indefinitely around these loops, and the process may not converge to a stable equilibrium . One can find examples of loopy graphs, where, for certain parameter values, the BP/NBP algorithm fails to converge or predicts beliefs that are inaccurate. On the other hand, the BP/NBP algorithm could be successful in graphs with loops, e.g., error-correcting codes defined on Tanner graphs that have loops . In order for BP/NBP to be successful, it needs to avoid over-counting[20, 22], a situation in which the same evidence is passed around the network multiple times and mistaken for new evidence. Of course, this is not the case in tree-like graphs because a node can receive some evidence only through one path. In a loopy network, over-counting could not be avoided. However, BP/NBP could still lead to nearly exact inference if all evidence is over-counted in equal amounts. This could be formalized by unwrapped network corresponding to a loopy network. The unwrapped network is a tree-like network constructed such that performing BP/NBP in the unwrapped network is equivalent to performing BP/NBP in the loopy network. The importance of the unwrapped network is that since it is tree-like, BP/NBP on it is guaranteed to give the correct beliefs. However, usefulness of this beliefs depends on the similarity between the probability distribution induced by the unwrapped network and the original loopy network. If the distributions are not similar, then the unwrapped network is not useful and the results will be erroneous as in original loopy network. For the extensive analysis of this problem, we refer the readers to [15, 22, 23]. Junction tree (JT) algorithm is a method for the exact inference in arbitrary graphs. That can be proved by elimination procedure . It is based on triangulated graph, i.e., a graph with additional “virtual” edges, which ensure that every loop of length more than 3 has a chord. In triangulated graph, each 3-node loop (which is not part of any larger clique) represents 3-node clique, and each edge (which is not part of any 3-node clique) represents 2-node clique. Larger cliques (> 3) should be avoided, but this is usually not possible even with the optimal triangulation procedure. Using these cliques as hypernodes, we can define a cluster graph by connecting each pair of the cliques with minimum one common node (i.e., non-empty intersection). Using cluster graph, we can create a lot of clique trees, but just one (or very few) of them represent the JT. The JT is a maximum spanning tree of the cluster graph, with weights given by the cardinality of the intersections between cliques. It is already proved  that this is a way to satisfy the main property of the JT, the running intersection property (RIP). The RIP is satisfied if and only if each node, which is in two cliques C i and C j , is also in all cliques on the unique path between C i and C j . If the RIP is not satisfied for one node, there is no theoretical guarantee that its belief in one clique is the same as its belief in another clique. We illustrate the whole procedure in Figure 1. We first triangulate the graph by adding the edge between nodes 2 and 5 (Figure 1a). Then we form the cluster graph (Figure 1b) with cliques C i (t, u, v) and the separator sets S i j (q, r) (S i j = C i ∩C j ), where t, u, v are the nodes in the clique, and q, r are the separator nodes. Finally, any spanning tree represents the clique tree, such as ones in Figure 1c,d. The tree in Figure 1d is the maximum spanning tree (|S 12| > |S 13|), so it represents the JT of the initial graph. Note that the tree in Figure 1c does not satisfy RIP since the node 6, which is in C 1 and C 2, is not in C 3. Illustration of junction tree formation (a) Triangulated 6-node graph, and corresponding (b) cluster graph, (c) clique tree, and (d) junction tree. The described procedure represents the exact formation of JT, also called chordal graph method. The main problem of this approach is the triangulation phase. Finding, a minimum triangulation, i.e., one where the largest clique has minimum size, is NP-hard problem due to the number of permutations that must be checked. Of course, there exist an approximate methods (e.g., ) which are less expensive, but still too costly according to authors. For more details, see Chapter 10 in . Due to the high complexity of the optimal JT formation, it is necessary to find some approximation that will be suitable for the cooperative localization problem. Therefore, our goal is to achieve the following. The number of cliques should be reasonable (i.e., in the order of number of nodes). In order to reduce the dimensionality of the problem, each clique should include no more than three nodes. Since the triangulation is expensive procedure, we are going to avoid it, even if it causes the break of RIP for some small percentage of the nodes. After these approximations, the final result represents, strictly speaking, the clique tree. However, since it is very close to the junction tree (measured by the percentage of the nodes that satisfies RIP), we name it PJT. In order to satisfy the conditions (a) and (b), we need to decrease the number of the edges in the graph by formation of thin graph. Assuming that each edge provides the same (or sufficiently similar) amount of information, it can be done using a modified version of breadth first search (BFS) method. The standard BFS method  begins at randomly chosen root node and explores all the neighboring nodes. Then each of those neighbors explores their unexplored neighbors, and so on, until all the nodes are explored. In this way, there will not be a loop in the graph because all the nodes will be explored just once. Thus, the final result of BFS is the spanning tree. The worst case complexity is O(v + e), where v is the number of nodes and e is the number of edges in the graph, since every node and every edge will be explored in the worst case. Nevertheless, the spanning tree is very coarse approximation of the original graph since it excludes a lot of edges from the graph. For example, in any spanning tree, one communication failure breaks the graph into two parts. As a consequence, we need more spanning trees in order to have reasonable accurate inference in graphical models. Therefore, we modify standard BFS method by permitting each root node to make an additional visit to the node that was already visited by some of the previous roots. All edges found by first and second visits, along with all the nodes from the original graph, represent the thin graph. In addition, the second visit will automatically form a loop, so we use it to form 3-node clique. The 2-node cliques can be found easily by taking all the edges that appear in thin graph, but not in any 3-node clique. The worst complexity is O(v + e + v · (v - 1)) ≈ O(v 2), since for each of the additional visit, we need to check all previous roots (all the nodes minus one, in the worst case). The detailed pseudocode is shown in Algorithm 1, and an example of the original graph and the corresponding thin graph are shown in Figure 2a,b, respectively. Illustration of thin graph formation (a) Example of 10-node graph, and (b) corresponding thin graph. The initial root is node 1. The main benefit of the thin graph is that it mainly includes 3-node loops. The number of these loops, which is obviously always less than the total number of nodes, is nearly constant with respect to connectivity, so the number of cliques will nearly be constant as well. On the other hand, the main drawback is that there exist the loops which include more than three nodes.a These loops should be triangulated, but we prefer to avoid it in order to keep reasonable complexity. Thus, for n-node loops (n > 3), we form maximum n 2-node cliques, using each edge (which is not already subset of any 3-node clique) of the loop as a clique. Another problem can be caused by the nodes which cannot determine their positions due to the possible non-rigidity of the thin graph (e.g., the nodes with less than three neighbors). However, these nodes can be still located since we bounded the estimate within its bounding box (see Section 2), created using original (not thin) graph. Therefore, the estimates will never be out of these boxes, which means that we ensured a coarse estimate in the worst case scenario. Finally, we note that anchor-unknown links are not excluded, so it would be useful if the anchors are placed as close as possible to the edges of the deployment area, where the leaf nodes are expected. Having defined the cliques, we can form the cluster graph by connecting all pairs of the cliques with non-empty intersection (see Figure 3a). As we already mentioned, the JT, as well as PJT, is the maximum spanning tree of the cluster graph. It can be found using, e.g., Prim’s algorithm , as shown in Algorithm 2. The Prim’s algorithm is a method that finds a maximum (or minimum) spanning tree for a connected weighted undirected graph, meaning that the total weight of all the edges in the final tree is maximized (or minimized). In our case, the algorithm starts with a list (i.e., CurrentList in Algorithm 2) which initially includes only randomly chosen root clique. At each step, among all the edges between the cliques in the list and those not in the list yet, it chooses the one with the maximum weight and increases the list by adding the explored clique. Finally, it stops when all the cliques are spanned. The example of PJT is shown in Figure 3b. The worst case complexity is O(e·l o g(v)) , but in our case the weights are binary (|S i j | = 1, or |S i j | = 2), so the execution will be very fast. Illustration of PJT formation (a) Cluster graph based on thin graph from Figure 2 b, and (b) corresponding PJT (maximum spanning tree of given cluster graph). Each clique is placed at the centroid of its node positions. The root clique is (10,5). The BP/GBP methods are naturally distributed through the network which means that there is no central unit (fusion center) which will handle all computations. Thus, the proposed PJT formation should be done in a distributed way. It is already well known that there is a straightforward distributed way to form any spanning tree, so we refer the readers to [28, 29]. Having defined PJT, it remains to define the communication between neighboring cliques. Since the separator sets, between each pair of the neighboring cliques, are always non-empty, the separator nodes are responsible to perform the communication. Practically, these nodes represents the cluster heads. For example, in Figure 3b, the node 3 will request all the data from node 9, and upon receiving, it will send the data to node 10, and vice versa. Finally, the previous approximations will likely break the RIP for some small number of the nodes. For instance, in the PJT in Figure 3b, the node 10 (due to the non-triangulated 4-node loop: 3–9–5–10), and the node 7 (due to the appearance of 4-node clique: 2–6–5–7) do not satisfy the RIP. Therefore, we do not have a guarantee that the belief of that node in one clique is the same as its belief in another clique . Nevertheless, for cooperative localization, this is not a problem since we used the bounded boxes (see Section 2) for the initial set of particles. Regarding other applications, this method might be useful if all edges provide the same (or sufficiently similar) amount of information. Although we provided a tractable solution for formation of the approximated junction tree, we cannot claim that it is an optimal one. In literature, there are available alternatives that could be (with some adaption) applied for this problem. For example, Dechter et al. propose iterative join-graph propagation, which runs on the cluster graph with bounded cluster size, created without discarding any edges. Similar solution, thin junction tree with bounded cluster size, is available in . However, for both approaches, a distributed implementation is not provided, so they cannot directly be applied for our problem. Finally, it is worth mentioning a distributed method , which creates a rigid subgraph from the fully connected (complete) graph in a tractable way. However, this method can be applied for cooperative localization, only if adapted for non-complete graphs. Finally, the single-node beliefs can be obtained via further marginalization. Equations (3), (4), and (5) represent GBP-JT algorithm which is valid for any arbitrary graphs. The standard BP algorithm  is a special case of GBP-JT, obtaining by noting that the original tree is already triangulated, and has only pairs of the nodes as cliques. In that case, sets S i j are single nodes, and the marginalization is unnecessary. ψ t ( x t ) = 1 , within b. box 0 , otherwise . 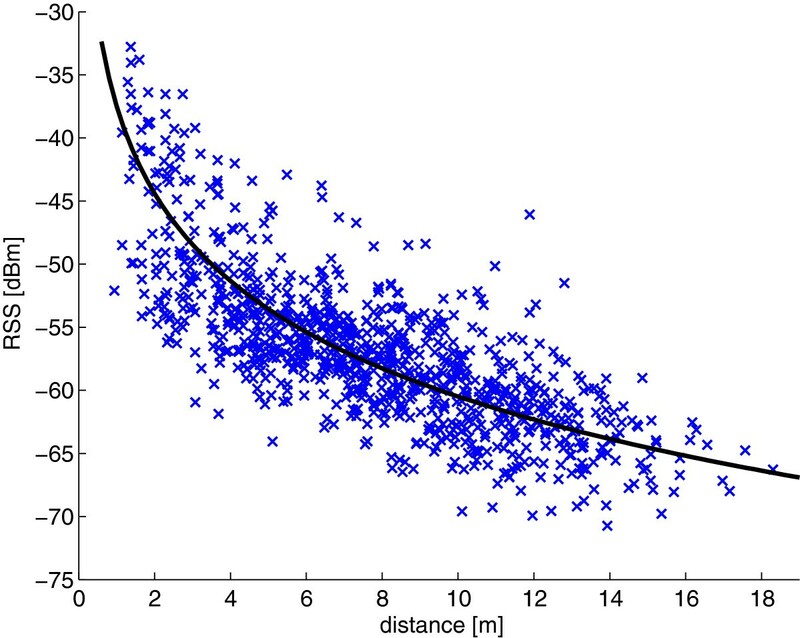 where d t u represents the measured distance between nodes t and u, p v (·) the noise distribution of the measured distance, and R the transmission radius. More general model, which incorporates the probability of detection, can be found in [11, 33]. Regarding the model for mobile scenario, assuming that information is moving only forward in time, there are no loops between different time frames. Therefore, a dynamic model should be defined on the original graph with nodes. One option is to include this information using single-node potential, i.e. where a dynamic model p(x t,τ |x t,τ-1) defines the possible positions of the unknown node x t,τ in current time instant τ, given the estimated position from the previous time instant. It is also necessary to create the PJT at each time instant, except if the structure in the graph remains the same. All other computations (within the same time instant) are the same as in the static scenario. Thus, for clarity, we discard subscript τ in all equations, and focus on the static scenario. More details on mobile positioning can be found in [13, 14, 34]. Due to the high complexity, the presence of nonlinear relationships, and potentially highly non-Gaussian uncertainties, GBP-JT method is not appropriate for cooperative localization . Thus, we need to use NGBP-JT. Moreover, due to the problems explained in previous sections, we are going to use PJT instead of JT. Therefore, in following subsections, we propose NGBP based on PJT (NGBP-PJT) for the arbitrary networks. Note that an analysis of NGBP-JT for the small-scale network has already been provided in . In this way, we have created two types of particles: the edges (for 2-node cliques), and the triangles (for 3-node cliques). We illustrated an initial set of particles in Figure 4. 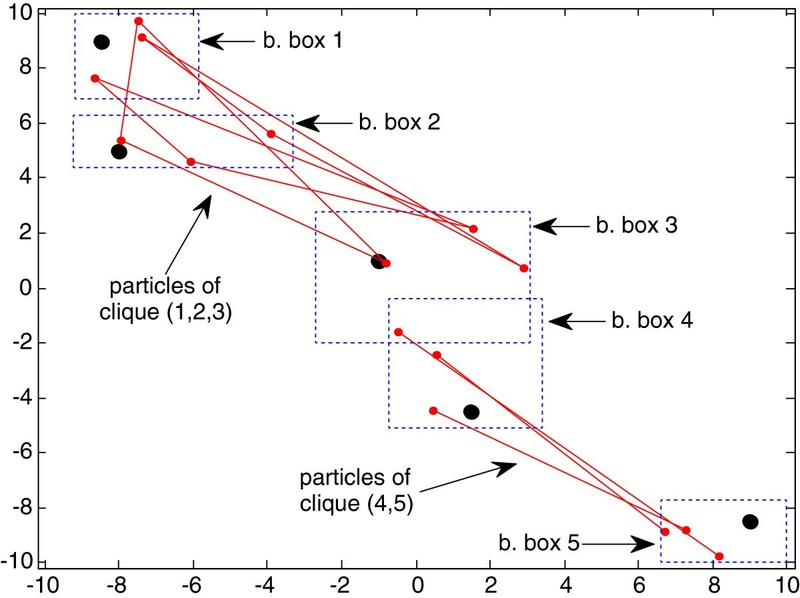 Illustration of initial particles from 2-node and 3-node cliques (for clarity, we show only 3 particles). Note that all the particles are originally high-dimensional (6D or 4D), but they can be shown in 2D space thanks to the distance constraint. The true node positions are marked with black circles. where we assumed that the position of the anchor node is perfectly known (i.e., defined by Delta Dirac function). However, if anchors’ positions are uncertain (as in ), the message can be computed in the same way as the messages from the unknown nodes. According to (7), the belief of clique i is a product of its clique potential and all the messages coming into the clique. Before drawing the particles, we need to solve two problems: (i) the messages include information about different nodes within the clique, and (ii) it is intractable to draw the particles from the product. where W C j , corr k , m + 1 is the correction of the weights due to the MIS, X t k , m + 1 particle from node t, m a t is the message from the anchor node a to unknown node t, and function choose chooses randomly one particle from G C j .
where we used the approximation M j m + 1 ( X C j k , m + 1 ) ≈ W C j k , m + 1 . The algorithm stops when K L j m + 1 (for all j) drops below the predefined threshold. However, it is also possible to predefine the number of iterations, given diameter of the graph and transmission radius. We choose the latter approach in simulations. The final estimation of each node within the cliques is given as the mean of the particles from the belief in last iteration. Since the most of the nodes appear in more than one clique, we simply average multiple estimates. Other options are also possible, such as choosing the belief with the smallest entropy. We summarize the NGBP-PJT algorithm in Algorithm 3. 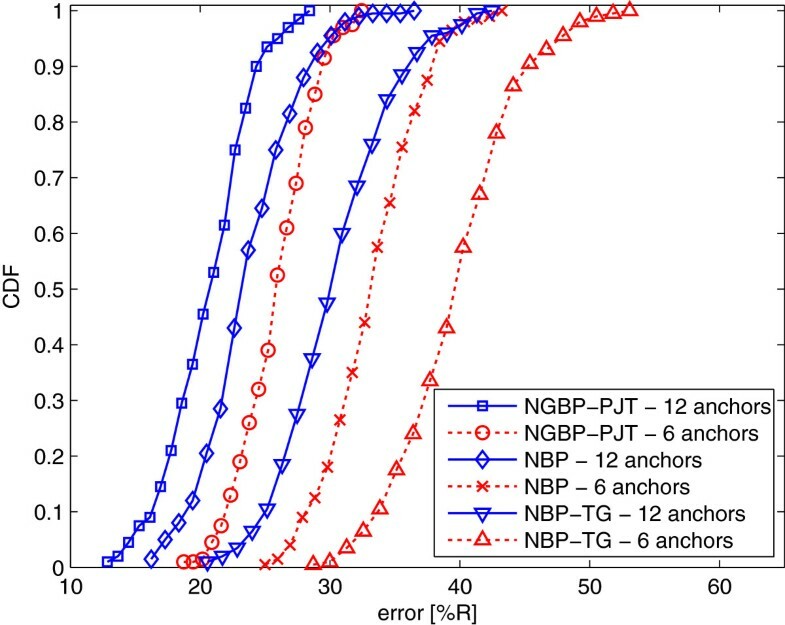 Finally, it is worth noting that a special case of NGBP-PJT method is NBP method based on thin graph (NBP-TG) assuming that the thin graph has only the pairs of the nodes as cliques. NBP-TG is very important by-product since it runs on the same graph as NGBP-PJT, which makes this method cheaper than NBP. It also helps to understand (as shown in the following section) how much the removed edges from the original graph affect the performance of the method. We assume that there are N a + N u = 60 nodes in a 20 × 20 m2 area. Four anchors are placed near the edges. This, usually realistic, constraint helps the unknown nodes near the edges which suffer from low connectivity. The rest of the anchors and the unknowns are randomly deployed within the area. The number of iterations is set to N iter = 3, which means that each node/clique will have available all the information 3-hop away from itself. The transmission radius is set to R = 8 m. Simulations are performed using N a = 6 and N a = 12 anchor nodes. We assume that the distance is obtained from RSS measurements using log-normal model, since this is usually the worst case scenario . Thus, we choose σ dB = 5 dB as standard deviation of RSS (i.e., the parametersd of log-normal distribution are μ = log(d) and σ = σ dB/10n p = 0.25, where n p = 2 is the path-loss exponent.e). Previous parameters are same both for NBP, NBP-TG, and NGBP-PJT. However, the number of particles is set to 100 (for NBP), 290 (for NBP-TG), and 210 (for NGBP-PJT), in order to make nearly the same computational time for all three methods (see Table 2). For the KDE of the messages, the bandwidth is found using “rule of thumb”, which is the simplest option. Finally, the following simulation results represent the average over 20 Monte Carlo runs (in each of them, there are N u estimates available). Note that all defined parameters are valid only if not otherwise stated in the following text. Using the defined scenario, we compare the accuracy and the convergence of NBP, NBP-TG, and NBP-PJT algorithms. The error is defined as Euclidean distance between the true and the estimated location. First, we illustrate the results of these methods in Figure 5. We can see that NBP-PJT method significantly outperforms both NBP and NBP-TG methods, and also that NBP slightly outperforms NBP-TG. Illustration of results for the 60-node network. (a) NBP, (b) NBP-TG, and (c) NGBP-PJT. The anchors are marked with red squares, the unknowns with black circles, and the estimated locations with black dots. Then, for randomly chosen node, we illustrate its initial and final belief in Figure 6. First, the initial beliefs of NBP and NBP-TG represent nearly uniform distribution within its bounded box, but the initial belief of NGBP-PJT (which is also within its bounded box) is not uniform due to the distance constraints within appropriate cliques (see (13)). Thus, the initial belief of NGBP-PJT is more informative than the belief of NBP. Second, we can see that the final NBP belief is the tightest, but this information is overconfident comparing with NBP-TG and NGBP-PJT. Since NBP-TG and NGBP-PJT run on the same graph, we can say that NBP-TG is overconfident, comparing with NGBP-PJT, due to the loops. Regarding comparison between NBP and NBP-TG, we note that the latter one has less number of the edges and less number of the loops. This increase the uncertainty, so NBP-TG provides more uncertain belief. The level of overconfidence can be also analyzed using the true position of the node. Hence, in case of overconfident belief, the true position can be located in the area with probability close to zero (as shown in Figure 6). Therefore, we can conclude that NGBP-PJT is less informative, but more trustful. Moreover, in order to obtain more precise conclusion about accuracy, we also consider cumulative distribution function (CDF) of the error in position. We can see in Figure 7 that NGBP-PJT outperforms all other methods in terms of any percentile. 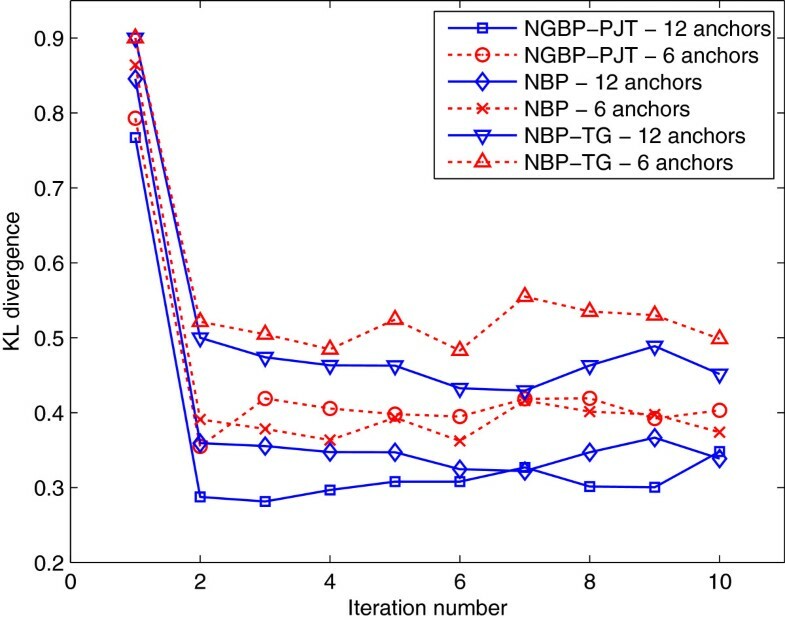 Comparison of NBP, NBP-TG and NGBP-PJT beliefs in the first and last iteration. True position of the node is marked with X.
CDF of root mean square (RMS) error in position. Furthermore, we provide the analysis of the RMS error with respect to transmission radius. According to Figure 8, the NGBP-PJT significantly (5–10%) outperforms NBP and NBP-TG, for all R and both values of N a . It is also worth noting that the number of anchors significantly affects the accuracy. 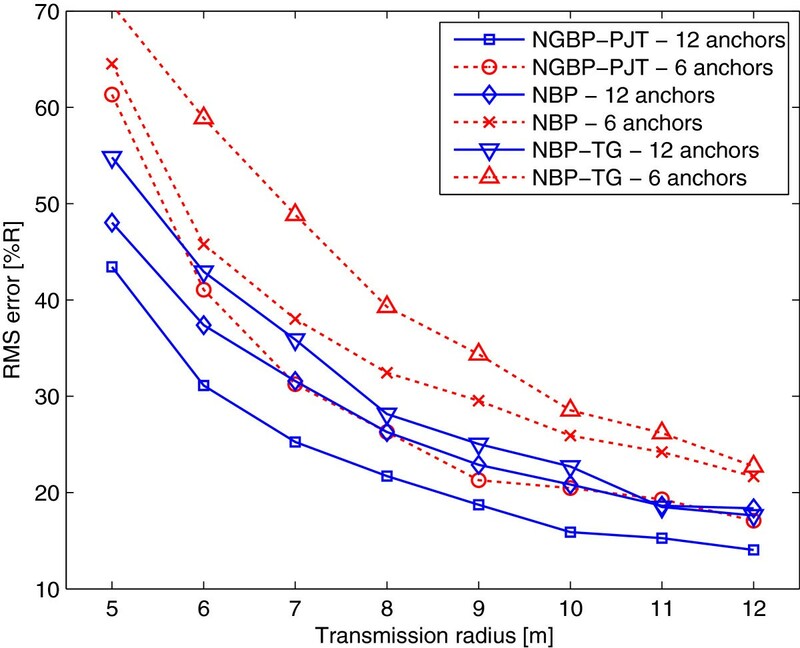 For instance, NGBP-PJT with 6 anchors performs similar as NBP with 12 anchors. Therefore, given nearly the same accuracy, one can decrease the equipment cost by removing 6 anchors (which are usually very expensive). It is also interesting to note the performance difference between NGBP-PJT and NBP-TG (since they use different message passing, but the same graph), and the difference between NBP and NBP-TG (since they use the same message passing, but different graph). The effect of transmission radius on RMS error in position. Regarding convergence, we can see in Figure 9 that all algorithms converge sufficiently after second iteration. This is expected since we set R = 8 m, so almost all information is maximum 2-hop away from each clique. Finally, we can see that all algorithms, especially NBP-TG, cannot perfectly converge (i.e., K L→0) after reasonable number of iterations. This is, of course, caused by the existence of loops (for NBP and NBP-TG), and missing edges in thin graph (for NBP-TG and NGBP-PJT). Comparison of KL divergence in each iteration. As we already mentioned, we set the same computational cost for R = 5 m by choosing appropriate number of particles for all three methods. It was not possible to set the same cost for all methods since the cost is more sensitive to R in case of NBP method. On the other hand, NGBP-PJT and NBP-TG costs are less sensitive to R due to the nearly same number of edges with respect to (w.r.t.) R, in formed thin graph. We provide the average cost per node for different values of R in Table 2. We can see that the cost of NGBP-PJT is the same or less for all considered values of R. We can also see that the complexity of the PJT formation is neglectable comparing with full algorithms. NGBP-PJT significantly outperforms NBP and NBP-TG methods, for reasonable number of unknowns. 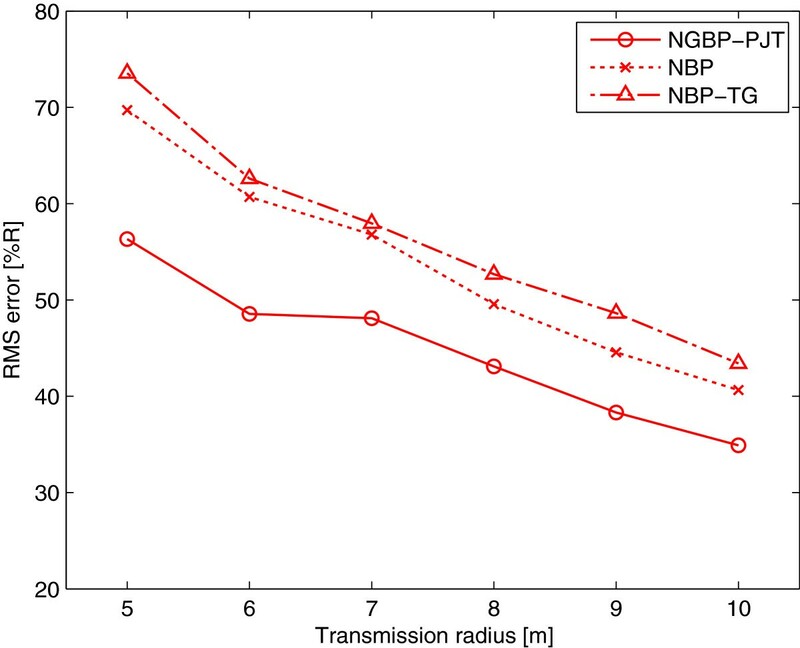 Comparing with NBP, the improvement of NGBP-PJT is increasing as transmission radius increasing. This is achieved thanks to the thin graph. The cost of NBP-TG is slightly less than NGBP-PJT due to the redundancy in PJT graph (i.e., when the same node appears in more than one clique). Increasing the number of unknowns will decrease the benefit of NGBP-PJT. This is caused by quadratic dependency of PJT formation w.r.t. number of unknowns. Using results from Figures 10b and 11, we estimate that NGBP-PJT will reach the same cost as NBP, for 140 unknown nodes. Communication cost for PJT formation w.r.t. (a) transmission radius, (b) number of nodes. 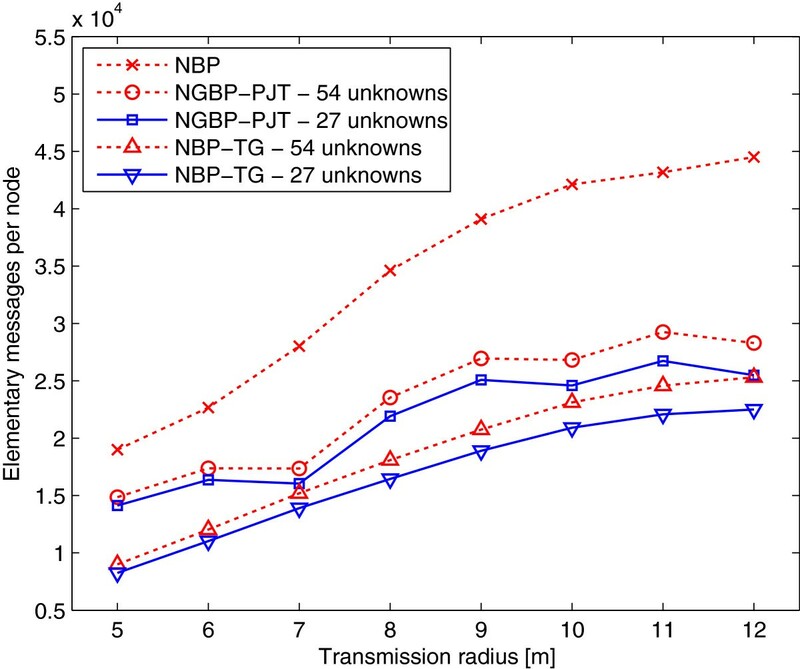 The effect of transmission radius on communication cost (for two different number of unknowns). NBP cost is the same for any number of unknowns, so we just plot one curve. Finally, we can conclude that the proposed NGBP-PJT method is cheaper for reasonably sized networks. However, it can also be cheap for very large-scale networks if the network is divided into regions, and one PJT created for each of them. We now test NBP, NBP-TG, and NGBP-PJT using real RSS data obtained in indoor environment. The experiments are performed by Patwari et al. and the data are available online . They marked 44 points in a 14×13 m2 office area (see Figure 12), with many obstacles typical for that environment (cubicle walls, desks, computers, etc.). The measurement system includes one transmitter and receiver which uses a wideband direct-sequence spread-spectrum (DS-SS). The transmit power was 10 mW, and the center frequency 2443 MHz. The measurements are conducted by placing the transmitter and receiver at each pair of the points, and taking 5 measurements for each combination (totally, 9460 measurements). Then, for each measurement, TOA and RSS have been estimated, and for each link, the average has been found. More details about the experiments can be found in . The deployment of the sensors in a 14 × 13 m 2 (obstacles are not shown). The photo of the area can be found in . In this article, we use averaged RSS samples, shown in Figure 13. Taking P 0(d 0 = 1m) = -37 dBm, the parameters of the log-normal model can be found: n p = 2.3 and σ d B = 3.92 dB. Then, we compare the accuracy of NGBP-PJT, NBP-TG and NBP as a function of transmission radius (which varies from 5 to 10 m). The number of particles is the same as for the test in Section 2, and the number of anchors is set to N a = 5 (marked as red squares in Figure 12). The results are averaged over 20 Monte Carlo runs (in each run, we use different seed for the particles, but keep the same network and the corresponding measurements). As we can see in Figure 14, the conclusion is the same as for the previous test (Section 2) based on synthetic data: NGBP-PJT outperforms NBP and NBP-TG, for all considered R. However, comparing Figures 8 and 14, we note that the values of the errors has changes. Obtained measurements (marked with X) and the corresponding log-normal model (black line). The effect of transmission radius on RMS error, for the network shown in Figure 12 , and the measurement model shown in Figure 13 . In this article, we presented NGBP-PJT, a novel message passing approach for cooperative localization in wireless networks. Since the exact formation of junction tree is intractable, we proposed the formation of PJT, which represents the approximated JT based on thin graph. In addition, in order to decrease the number of particles for NGBP-PJT method, we proposed a more informative importance density function, and also reduce the dimensionality of the messages. As by-product, we also proposed NBP-TG, a cheaper variant of NBP, which runs on the same graph as NGBP-PJT. According to our simulation and experimental results, NGBP-PJT, outperforms NBP and NBP-TG in terms of accuracy, computational and communication cost in reasonably sized networks. In addition, NGBP-PJT beliefs are not overconfident as NBP beliefs, so we can obtain online more trustful information about the position uncertainty. Finally, all algorithms converge sufficiently after very small number of iterations, but the convergence is not perfect. There remain a number of open directions for the future work. One direction could be to find an alternative method (e.g., modified variants of the methods described in Section 2), which will be tractable in large-scale networks. It would be also useful to find in which graphs, and under which conditions, the benefit gained by using a NGBP-PJT instead of NBP outweighs the penalty caused by discarding edges. Moreover, an important research line is to investigate if there is some cheaper (non-particle-based) message representation, which should be capable to handle all realistic uncertainties. Finally, distributed target tracking in sensor network [42, 43] could be an interesting direction since this application requires a number of sensor nodes with known (or estimated) positions. aAccording to our empirical analysis, the number of these loops is relatively small (e.g., just one 4-node loop in Figure 2b).bWe implicitly assumed that q C i 1 ( x C i ) = 0 if the state of one of the clique nodes is out of the deployment area.cIn practical circumstances, we can set ϵ = 0.dNote that these values do not represent the mean value and the standard deviation of the distance. They are respectively given by: μ d = e μ + σ 2 / 2 , σ d = μ d e σ 2 - 1 . Consequently, these parameters are distance dependent.eTypical values for n p are between 2 and 6 . For the distance estimation, the minimum value is the worst case.fExact communication cost can only be measured by knowing the hardware specifications, especially, the amount of the bytes in the package, number of reserved bytes in package, energy required to transmit a package, etc. This study was supported in part by the FPU fellowship from Spanish Ministry of Science and Innovation; program CONSOLIDER-INGENIO 2010 under the grant CSD2008-00010 COMONSENS; the European Commission under the grant FP7-ICT-2009-4-248894-WHERE-2; the Swedish Foundation for Strategic Research (SSF) and ELLIIT.